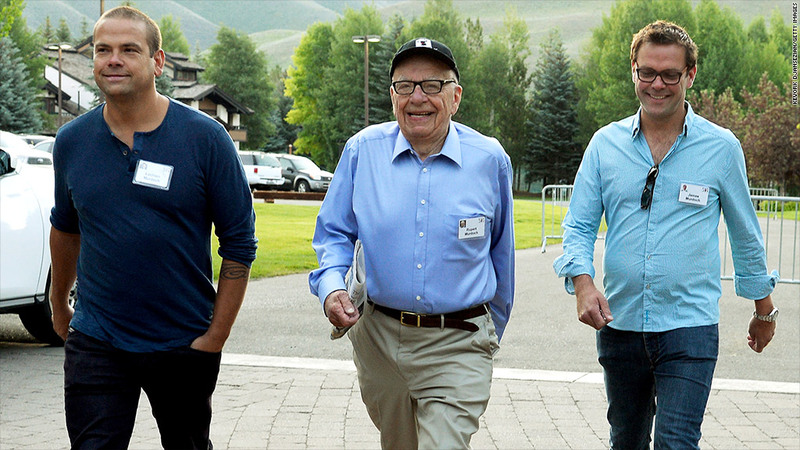 Rupert Murdoch, center with his sons Lachlan, left, and James, right, at a media conference last July. Media mogul Rupert Murdoch has tapped his son Lachlan to take on the positions of non executive chairman at both News Corp and 21st Century Fox, the two companies where the elder Murdoch serves as chairman, in a possible signal of his succession plans. Additionally, Rupert Murdoch named his other son James as co-chief operating officer at 21st Century Fox (FOXA), the company that includes the Fox broadcast network, Fox News, Fox Sports 1 and the Fox movie studio. Rupert Murdoch, 83, will retain his chairman positions at the two companies as well as the CEO post at 21s Century Fox. Chase Carey, who has long been Murdoch's No. 2, will retain his post as president and chief operating officer at 21st Century Fox. Lachlan Murdoch, 42, has been a director of both companies, but he essentially left his family's media empire in 2005 and started a private investment company. 21st Century Fox and News Corp (NWS) were split into two separate companies in 2013 after the company was rocked by a phone hacking scandal that forced it to close its London tabloid, News of the World. James Murdoch, 41, who at the time was seen as the likely successor to his father rather than his older brother, was caught up in that scandal. He had served as chief executive of the publishing unit which oversaw News of the World. Both James Murdoch and his father were forced to testify before the U.K. Parliament about the scandal. After that, James resigned from both his print position as well as his position as chairman of the British broadcaster BSkyB following that scandal. About a third of shareholders of the old News Corp., which included both parts of the media empire, voted against Lachlan and James' re-election to the board. The company settled more than 100 phone hacking cases with some of Britain's top celebrities last year.